Timolat eye drops (Timolol Maleate) is a non-selective beta adrenergic blocking agent. Indicated in the treatment of elevated intraocular pressure with ocular hypertension associated with open angle glaucoma and aphakic glaucoma. 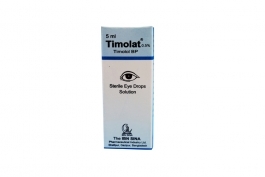 Timolat is available as 5 ml sterile eye drops. Tomycin eye drops & eye ointments (Tobramycin) an aminoglycoside preparation. Indicated for superficial ocular infection and its adnexa like conjunctivitis, blepharitis, blepharo- conjunctivitis, keratitis, corneal ulcer etc. caused by susceptible bacterial organism. 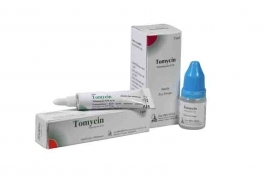 Tomycin is available as 5 ml sterile eye drops and 3 gm sterile eye ointment. Tomycin-D eye drops (Tobramycin & Dexamethasone) ia a antibiotic+Steroid combination preparation. Used in superficial ocular infection and its adnexa like conjunctivitis, blepharitis etc & also indicated in chronic anterior uveitis and corneal injury from chemical, radiation or thermal burns or penetration of foreign bodies. 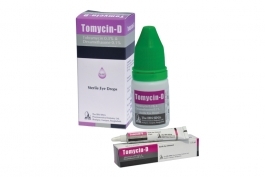 tomycin-D is available as 5 ml sterle eye drops and 3.5 gm sterile eye ointment. 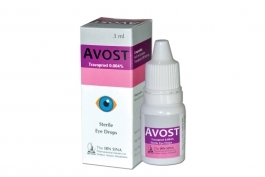 Avost eye drops (Travoprost) is a class of anti-gluocoma,synthetic prostaglandin analogue. 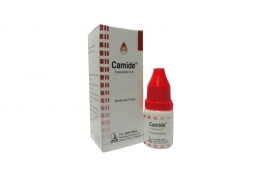 Used for the treatment of elevated intraocular pressure in patients with ocular hypertension or open-angle glaucoma. Avost is available as 3 ml sterile eye drops . 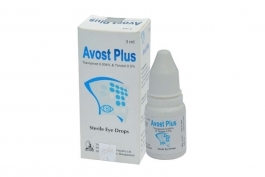 Avost Plus eye drops is an anti glaucoma preparation for topical use. Indicated for the treatment of glaucoma. It is available as 5 ml sterile eye drops.